Tah Dah...an old album. Perfect for Tune Time Tuesday!!! 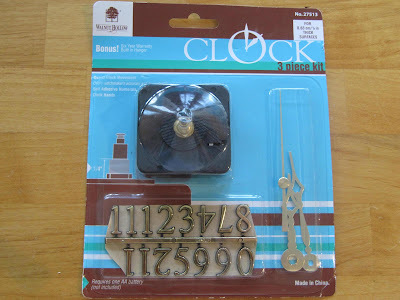 Most hardware or craft stores sell these clock kits. I bought this one at Walmart for $5.00. The stem, that sticks through the hole in the face of the clock, comes in different sizes depending on the thickness of the clock. 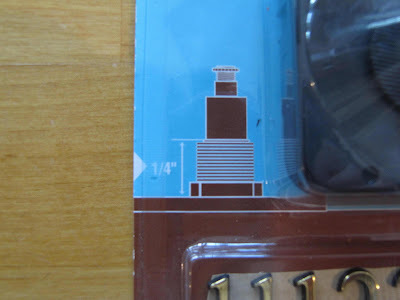 I picked the 1/4 inch. Here are all the parts...some kits may be different, but still very easy to put together. I went to a Goodwill Store on our travels looking at colleges and I bought this album in honor of my mom. She absolutely LOVED Andy Williams. However, she is looking down on me from above cringing for what I'm about to do to this record!! 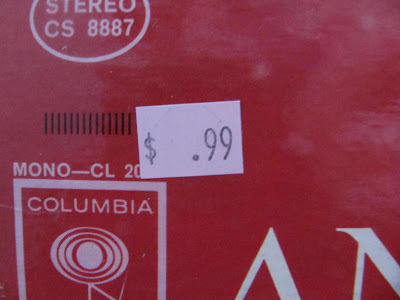 Not to mention, I only paid 99 cents for it, so I couldn't pass it up. I'll keep the cover in tact for her. 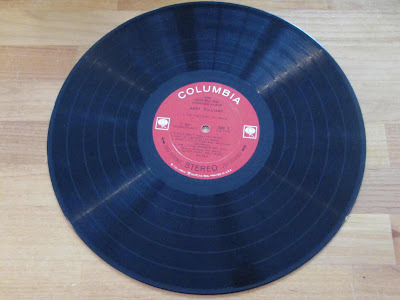 First step is to see if your particular clock stem will fit through the hole in the record. Mine was just a hair off, so I used a drill that was a little smaller than the hole and moved it around the hole shaving off a little at a time. 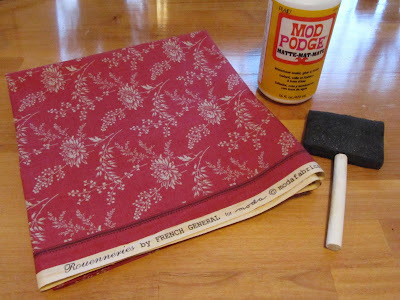 Now pick your favorite fabric to match a room (I just love Moda's Rouenneries), some Mod Podge (which is a glue and sealer all in one) and a foam brush. 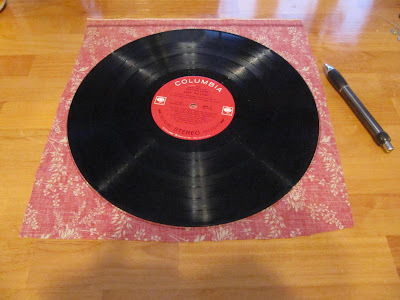 Cut a piece of the fabric a little bigger than the record. 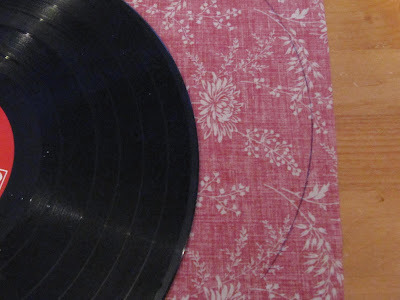 Now trace around the record album on the wrong side of the fabric. 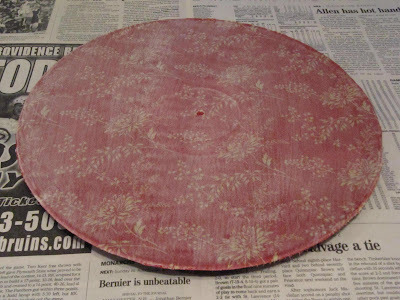 Cover your work surface with paper and pour the Mod Podge onto a paper plate. 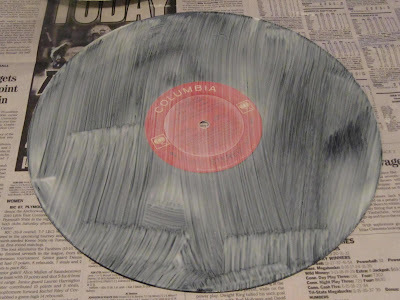 Paint the Mod Podge on the entire surface of the album. 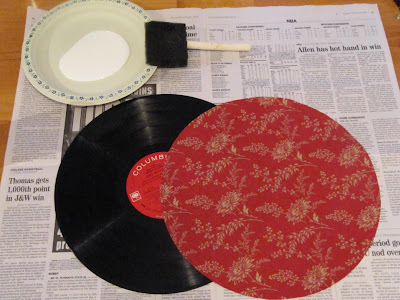 Place the fabric circle onto the glue that's on the record and then paint another layer of the Mod Podge onto the fabric. Be careful not to stretch the fabric too much. If you do, you can trim the edges that hang over a little bit once it hardens. 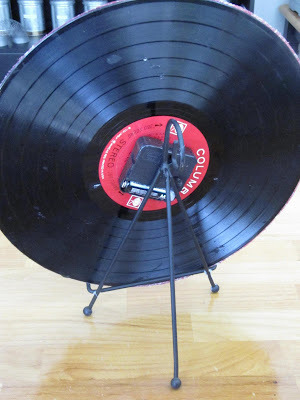 I placed the record onto something that would elevate it above the table so the edges wouldn't stick to the paper. 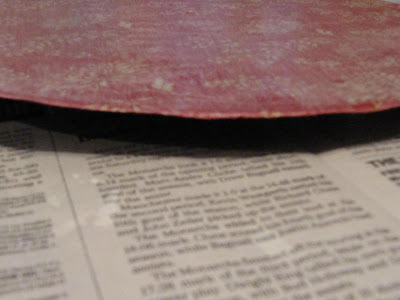 Now you just have to wait until it completely dries and hardens. 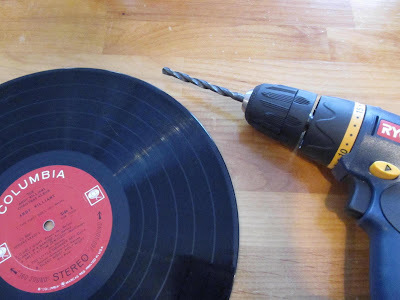 Once it's hard, you need to take a sharp pokey thing and poke out the little hole in the center of the album. 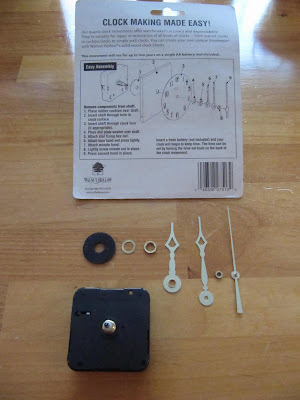 Here's where you would assemble your clock works according to the directions on your own package, but it is very easy. 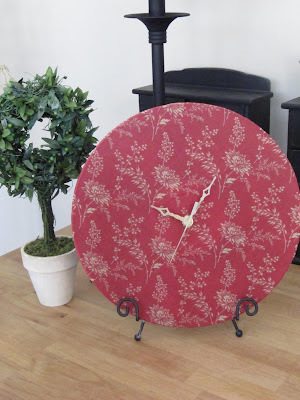 And here you have it...a beautiful clock to match your room decor or a quilt that you've made with the same fabric. Great for any room in the house. I put mine in a plate holder to photograph it until I decide where I want to hang it in my bedroom. This is a picture of the back. It takes just one AA battery and the backing has a hole in it to hang it on the wall. The package also came with numbers, but I haven't decided to use them yet. I think it would be cute to use different little items for the numbers. How about old bobbins for the 12, 3 , 6 and 9 positions on the clock for you sewing room. If it's for a child's room, you can use Legos, flowers, bows, or little toys. For an office clock you can use paper clips. The ideas are endless. The only thing I might do next time is maybe paint the album the color of the fabric I've picked. If you have chosen a light fabric, the black will show through, so maybe a little paint wouldn't hurt. I have one more thought for this project. 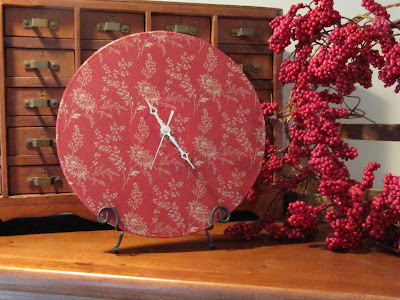 If you pick another seasonal fabric, you can glue that to the other side and all you have to do is unscrew the clock works, turn the album around, put it back together and now you have another clock for a different "time" of the year. I hope you enjoy this project and remember to always keep a song in your heart! I have a bunch of old albums (not to mention 33rpm records from my parents). This is such a cute idea. And the clock looks great in the plate holder. I wonder if chalkboard paint would work for a playroom?? Your are too clever, I am amazed sometimes by your neat, often simple, ideas. Thanks! Love it! Another great idea. Great idea but I could have cried when I saw the album you used. If only I had found it first! That Christmas album is my favorite and reminds me of Christmas growing up with my sibs. 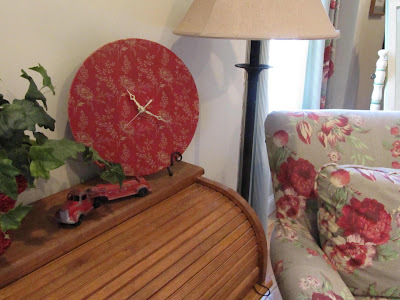 With your post I got a 2 for 1 - a trip down memory lane and a great idea for a lovely clock! 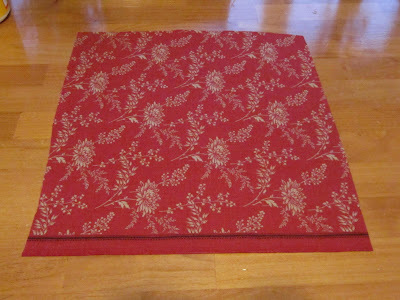 Pete made one of these before Christmas (without the fabric). I think he assembled the clock works incorrectly, because the second hand doesn't turn and it doesn't keep time. No one has made the effort to fix it, so it has become a dust collector. When my kids were little, we had that Christmas album! When my eldest daughter married, I was able to find it on CD and give it to her to share her memories of Christmas with her family. Such a smart idea! Thanks for another wonderful tutorial Karen! You are brilliant! You have done it again. I just love your blog and all of your very green, economical, useful and cute ideas. I will be back for sure. So cute. 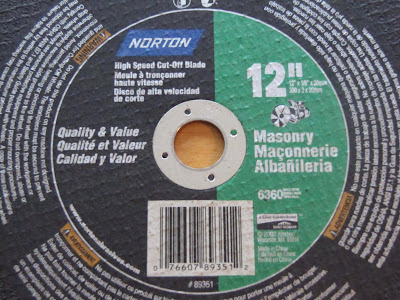 If you found the right saw blade hole size, you could make a clock for the man cave.....ha! I think it could be done with some large washers, worked down to the right size. You know how ever many it took to get down to the right size....3? Love the 'flip side' idea! Another wonderful "Tool Time"! Lemme see, which record will I sacrifice? Then to the stash pile! You've done it again, Karen! Another fabulous post! I would really like to try this sometime - if I can find the time!!!! Where DO you come up with all these ideas! I love Andy Williams! And the Christmas album is a classic (sigh) - I would have been tempted to not cover it at all but have a vinyl clock - lol. Great tutorial though... thanks! up Andy Williams. He is a classic. dust the den. It's wonderful. Adorable idea Karen! ...hum, no clock in my sewing room...I think I'll be trying this. 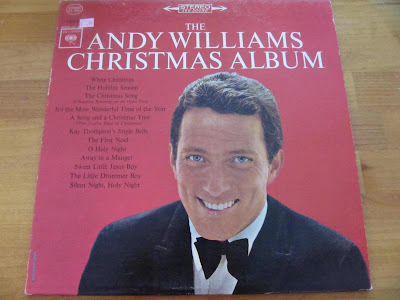 I need to mention that Christmas isn't Christmas in my parent's home without Andy William's Christmas album. Especially when he sings Silent Night. How ingenious is that? Love! WOW Karen!!!!! You never cease to amaze me! I would pay good money to come to a party inside your creative brain!!!! :-) I absolutely adore that clock... and the Rounneries... awwwwww...... I'm drooling!!! As for your previous post with the cup of tea and coffee on the desk in the same go... I do that too!!! I have a cup of tea, but then when my hubby (I can call him that now! :-)) makes a coffee, I just have to have one of those too! I'll email you later sweetheart, thank you for your lovely message on my blog. You know, there's always so much love in your blog... it's addictive! Lots of love to you darling lady! P'haps when you've made lots of these you will be able to make them in "record time". Sorry about the pun but I do think this is a lovely idea. This is fantastic! Thanks for sharing it! I just featured your great tutorial on my blog...Everything Etsy! 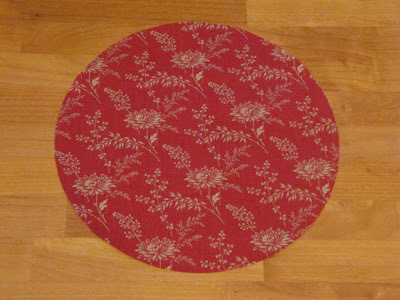 I am making one of these for our new gr-daughter (due mid-Mar) to match the crib blanket I am making her! Thanks for sharing such a cute and easy idea! Excited! I think I can hang with those little 3M command hooks too and save my walls a little pain. I must agree with what you think your mom would think and some of the ladies here - it breaks my heart that people destroy vinyl records. I've made several other clock projects using the very same Wal-Mart clock! I'm glad to hear they haven't gone up in price in the last 10-15 years! I really liked your original idea of the saw - I've seen some that were hand painted on and they were fantastic! The saw teeth really added to the project. I wonder if there is something that could be put into the saw hole to fill in so it would be the right size for the clock. Tks for this idea!